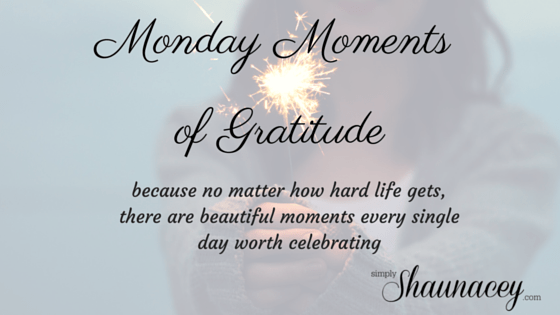 Linking up with Simply Shaunacey with her Monday Moments of Gratitude. This week I am thankful for healthy parents. 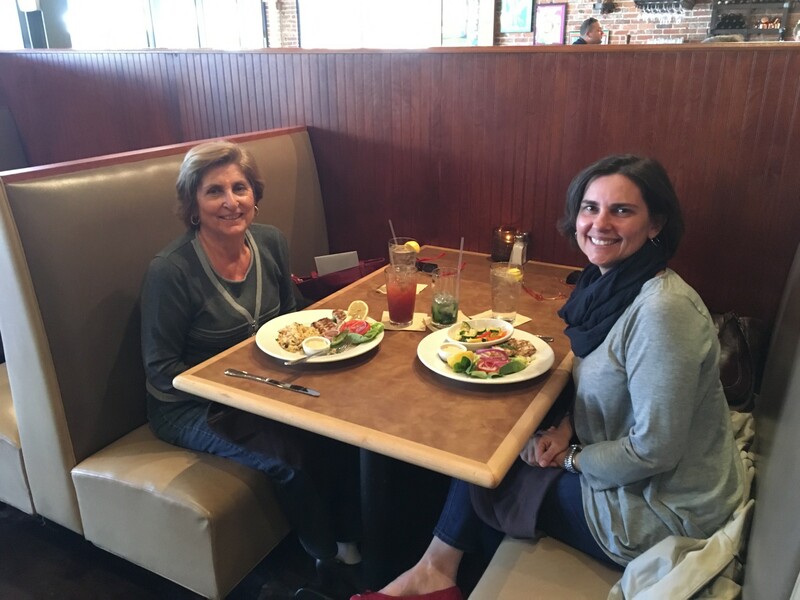 My mom had a birthday (73) and she and I had a lovely lunch together. I wanted to take her someplace she hadn’t been to before so I took her to The Brick Restaurant in Avondale. We had a cocktail (it was only 3:00 but it was 5:00 somewhere!) and a mahi mahi sandwich without the bun. It was a special time and I am being intentional about spending time with my parents, realizing that our time together will not last forever. Now I need to get mulch and maybe a few annuals to brighten up the space. That was a BIG job! 3. On Sunday some friends who are gifted at gardening (and decorating and throwing awesome parties) came over after church to give us some tips on redoing our backyard. 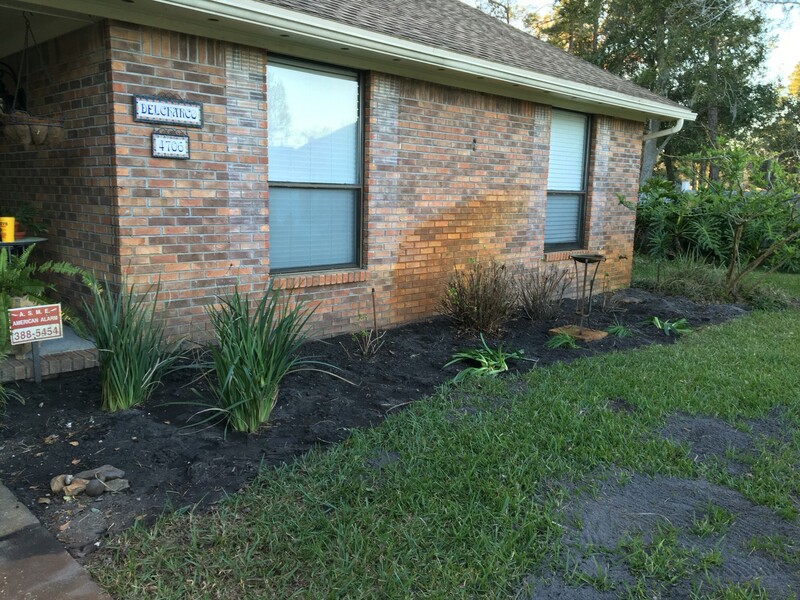 I spent two hours on Pinterest that morning so I knew what I wanted before they arrived and then Andrew suggested great plant ideas and how to reduce our grass and create intrigue. I can’t wait to start! I’m so thankful for them and their willingness to come over and kill spend two hours with us! 4. I’m thankful for Michael’s Uncle Richie. He passed away on Friday and we are so sad! It was a complete surprise! He was healthy and active and not at all showing signs of being sick. We still aren’t sure what happened. We are still reeling at his loss. But as we chatted about him we are so thankful for the times we had with him. 6. And I’ve been thankful for the weather the last few days. It’s been absolutely spectacular! I love that we were having birthday lunches with our mama’s on opposite sides of the country! I’m so sorry to hear about your Uncle – will keep you all in my prayers! Such sweet memories you have made with your parents. I pray you have peace and comfort over Richie’s passing. We have a new voter too; I’m curious to hear who your boys like. I just want to go sit in your flower bed and play with the dirt. It’s pretty good dirt! No rocks, lots of earthworms. Even found a glass snake that was buried! wow can I just say your mom looks freaking fantastic for 73?! wow. I will need all her secrets. And holy hanna your dad did an amazing job. That’s a TON of work but it certainly looks great. Yes, she has aged well! Lol! Fingers crossed that I’ll take after her!! I can’t wrap my head around having adult children either!!! I’m grateful for finding you, your sweet heart and joining you on TBB! Yay for new friendships! ❤️?? How blessed you are to have your mom and dad still in such great health! My mom turned 70 this year and I’m happy to have her still in good health. 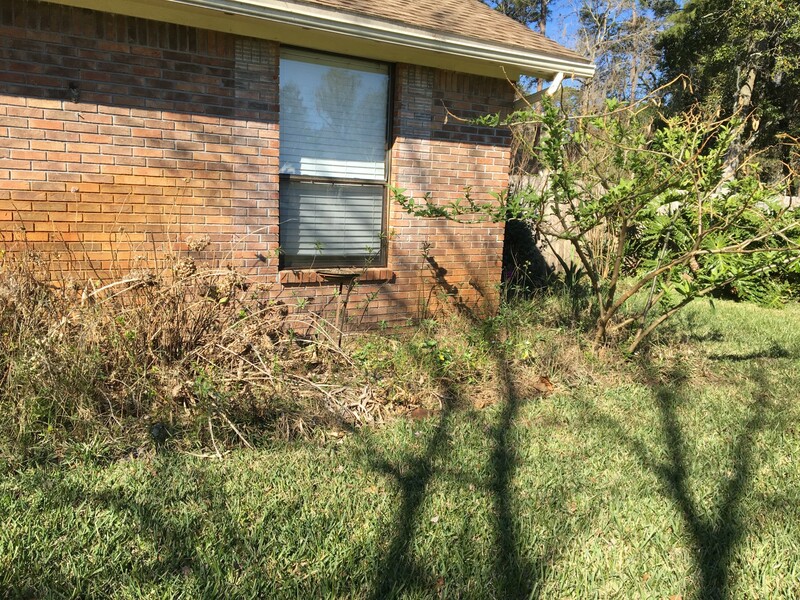 And that yard….oh my goodness such an improvement already! As I look around, i realize how incredibly blessed I am! Wait til you see what we have planned for the backyard! Thanks for stopping by! I’m jealous looking at your garden and seeing NO SNOW! I can’t believe you have adult children as well! Happy belated birthday to your beautiful mom. It’s always so shocking to lose a loved one. I’ll be praying for your family. Also, thank you for the reminder to be thankful for MY parents. Thank you! It’s a good reminder!! Sorry to hear about your uncle, and I hear ya on the parent thing, mine aren’t much younger than yours, and when thinking about when my grandparent died, I hope that I get tons more time with them! So thankful that they moved closer to us so they are part of the kids everyday lives. Yes! My parents live on our same street, about 20 houses down. My brother lives in our same cul-de-sac. Love living so close to family! Sheila, I am so sorry about your loss. I am so envious of the time you are spending with your parents. How close do you live to one another? I haven’t lived close to home (which has changed since the home of my childhood) since 1980. YIKES! I would love to have mahi mahi and drinks with my mom or garden with my dad (who is no longer living). Good for you to take advantage of precious time. And for recording their stories on your blog. Thanks Leslie! They live on our same street, about 20 houses down. My brother lives two doors down. We are a pretty tight family. I want to start interviewing my dad too and get his stories down. I realize I have a gift having family so close by and I am trying to make the most of EACH day! Some are better than others.